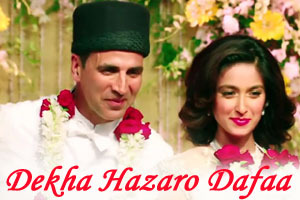 Nice romantic song in the voice of Arijit Singh and Palak Muchhal feautring Akshay Kumar and Ileana D'Cruz. The audio of this song is available on YouTube at the official channel Zee Music Company. This audio is of 3 minutes 50 seconds duration. Lyrics of "Dekha Hazaro Dafaa"
Lyrics in Hindi (Unicode) of "देखा हजारो दफा"